I'm FINALLY feeling almost completely well. I'm about 95% well which works for me! I have to cough every once in a while but that's okay. Caroline is all better. Mike, on the other hand, is worse! We're pumping more drugs into him (thanks, Tiff). Please say a prayer for him if you think of it. We went out today to Franklin, KY for some scrapbook shoppin' and dinner at the Cracker Barrel with Tiffany. We went to Card and Cloth in Franklin. It's moved to a little house right off the square. Too cute! I wish I had taken a pic. It's delightful! She had a lot of good stuff, very well-organized. We were impressed. Lots and lots of ribbon. I bought some new May Arts and a card of SEI from that fruity fruit line. The ribbon is presh. It has a rainbow one that reminds me of the 80's. The pic above is from this week when Caroline exchanged Valentines with our homeschool group. She made the box, isn't it cute? Speaking of Valentines, I need to make mine! Have you made any yet? Yippie Yi Yo Ki Yay! I'm so glad you are feeling better. I'm such a slacker. Just put up Valentine's clings on the windows and called it done. Oh, and we stuck some hearts on the mirrors around the house. I'm letting Page take STORE BOUGHT valentine's to school. Do people still make them? I mean, like REAL people? Oh we totally took store-bought Valentines for school! Care Bear with lollipops to be exact. I'm thinking of making some for my sweeties and my friends. Just for fun. You know how I do. That sounds so fun. You and Doris are going to turn me into a "ribbon-aholic" -- like so many other NEW addictions in my life. Fortunately, I seem to share them with wonderful people like you...so at least we can go to the "treatment center" together. Have a great one...and as cold as it is outside I have no problem with saying "stay cool." Saying prayers for your dh. I sure hope he gets all better soon! I'll definitely lift up your hubby! 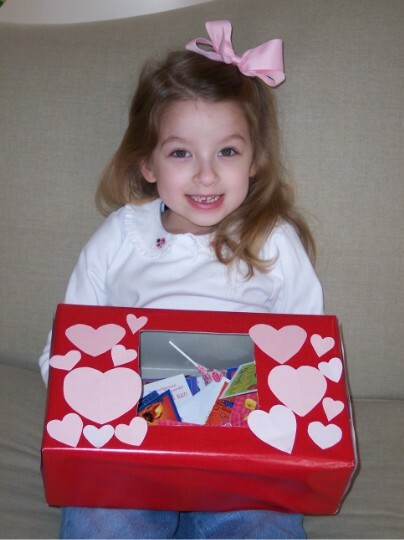 Love the Valentine box Caroline made. We have to get busy tonight making ours for the party tomorrow.